Sit? or Sit! -- The Case for Intonation When Speaking to Your Dog. "Sit." How you say it matters! All of us talk to our dogs. There are times we probably talk way more than we need to, and there are certainly times we speak in ways that have little to no real meaning for our dogs. I'm guilty of carrying on long conversations with my pack. Acting as if they comprehend all the banter when in fact, I know it is mostly just a babbling noise to them. "Hi Sweetie! Did you have a good day today? Boy, I'm glad to be home! Are you excited we can go for a walk now? Where's your leash? Oh, yes, here it is. Great! Okay, let me get my shoes on. Now where are the poop bags? Okay, wait a minute, wait a minute, hang on (because the dog is now jumping around and excited to go out the door). Yes, we're going. Let me clip this leash on. Hold still (more wiggling, jumping and whining). I said please hold still! Come here. Would you just wait a minute? Ugh. Sit!" Your dog then sits, you clip on the leash, and head out the door for your walk in a slightly flustered state of mind. But whose fault was it when that bit of chaos ensued? Intonation has a significant impact on our dogs. How we say things is as important, perhaps more important, than what we say. When we want excitement we can easily get it by using a higher pitch tone of voice. Higher pitch is typically accompanied by a slightly faster cadence of the words, and often by body language that has more movement involved. It is very, very easy for a dog to get excited by this type of behavior. If you consider the fact that dogs are predatory animals, think about what happens when they hunt? If the prey squeaks, squeals, and then runs, what happens next? Adrenalin kicks in and game on! If the animal they stalk turns and gives a low pitch vocalization accompanied by stiff posturing and stillness, the dog just might reconsider their intentions. 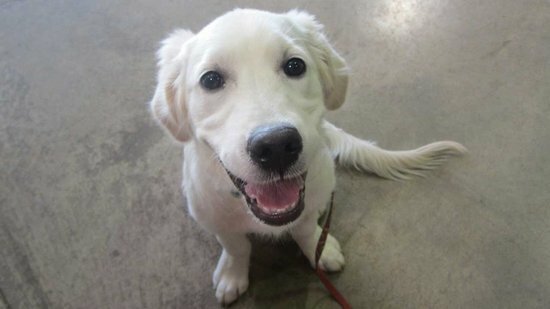 Dogs have an innate understanding of pitch, and we can learn to use it to our advantage when communicating. A higher pitch tone of voice can be used to generate excitement. You might want this when playing with your dog, encouraging him to try something that seems a bit intimidating, or motivating the dog to continue on when fatigue is setting in. A lower pitch tends to influence a sense of imperativeness. This is why it is suggested that most obedience commands be giving in a lower pitch. Particularly commands that direct a dog to stop motion. For words like "sit," "down," "whoa," "off," "out," and "quiet," the last thing we want to do is use a sing-song voice that implies a question mark at the end of the word. Sit? Drop-it? Be Quiet? A lyrical vocal quality does not imply leadership or imperativeness. It works best to use a neutral or slightly lower pitch with commands that are intended to get your dog to slow down, stop, or do something urgent. By comparison, you can ramp up the excitement and pitch when you want to increase adrenaline and enthusiasm. Developing clarity in how we say things means as much as the words themselves. The usefulness of vocal intonation extends beyond our canine friends. When you find yourself in a leadership role, whether it is with canines or people, pay attention to how you're using your vocal range. You might be surprised to see how much more cooperation you get when you learn how to fluctuate pitch and cadence to influence behavior. Pull-Quote= Sit. How you say it matters.